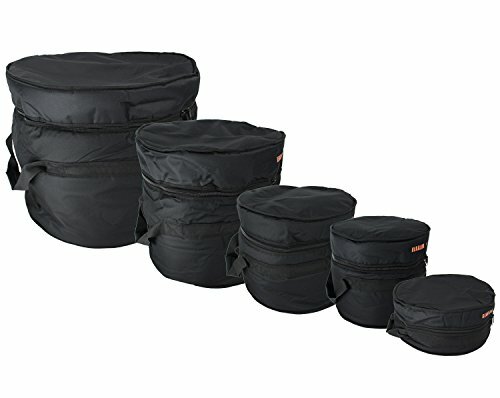 This Gearlux five-piece standard drum bag set is an essential item for all drummers. Store your drums safely and keep dust away or use the stitched nylon handles to transport your kit to the studio or stage. Lightweight reinforced nylon material provides excellent padding. Each bag is individually labeled, making it easy to identify your drums. Gearlux brand instrument accessories are perfect for musicians looking for quality gear at affordable prices. From stands and instrument cases to cables and piano benches, Gearlux has you covered. 12" Tom (12T): 14.5" x 12.5"
13" Tom (13T): 15" x 13.5"
14" Snare (14S): 15.5" x 6"
16-inch Floor Tom (16T): 18" x 18"
Bass Drum (22B): 24" x 21"